He [King Nebuchadnezzar] burned the house of the Lord, the king’s house, and all the houses of Jerusalem; every great house he burned down...The bronze pillars that were in the house of the Lord, as well as the stands and the bronze sea that were in the house of the Lord, the Chaldeans broke in pieces, and carried the bronze to Babylon. They took away the pots, the shovels, the snuffers, the dishes for incense, and all the bronze vessels used in the temple service, as well as the firepans and the basins. What was made of gold the captain of the guard took away for the gold, and what was made of silver, for the silver. The reading describes the destruction of the Temple of Solomon. The “First Temple” was built around 1000 BCE and then destroyed by Nebuchadnezzar II around 600 BCE. As portrayed in the Bible, the destruction of the Temple of Solomon was not an isolated act of war; it was the result of a long series of poor choices by various kings of Judah that alienated the people from God. Without a firm grounding in God, the kingdom could not stand against its enemies. 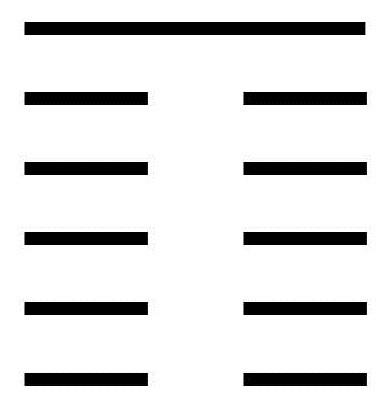 The hexagram shows a single strong line supported by five weaker lines. Collapse is coming. To understand how that which is strong is undermined by that which is weak, not directly, but by a gradual and almost imperceptible undermining until the strong eventually collapses. To accept that the strong are not in a position to accomplish anything. The strong are simply overwhelmed by the sheer numbers of the weak and the nature of the times. To not feel resentment against the times, but to accept the natural ebb and flow. To cultivate personal virtues such as generosity, especially to subordinates, knowing this will eventually pay off. A moving line in the bottom position warns of a dangerous situation. Mediocre people are on the rise. They are undermining the necessary foundations. Those who remain loyal are being hurt by slander and intrigue. The situation is not good, but there is nothing to do but wait. A moving line in the second position warns that the power of the mediocre is growing. There are clear indications that the danger is coming closer. Isolation is increasing. Extreme caution is called for. This is not the time for stubborn perseverance; this leads only to disaster. This is the time to be flexible and avoid danger. A moving line in the third position suggests one who is in a bad place but unable to extricate oneself because of commitments. Mediocre people are all around, but there is also a wise one who can bring stability. Naturally, the mediocre ones will not take kindly to the wise one. That is to be expected. A moving line in the fourth position suggests the disaster is now affecting not only the environment but also the one trapped in the environment. The danger has reached a peak and can no longer be avoided. It is a bad time. A moving line in the fifth position suggests a turn for the better. The nature of the dark force is undergoing a change. It no longer opposes the strong principle but now submits to its guidance voluntarily. This bodes well for both the dark and the light. All will end well. A moving line in the top position brings relief. The corner has been turned. Danger has spent itself, and better times are on the horizon. Those in power now embrace wisdom and effectiveness. Evil ones still battle, but now they battle against themselves. A house divided cannot stand. God’s law is at work: evil eventually destroys itself. The mediocre are advised to submit to the control of the wise.